Pipes are a tried and true smoking device. 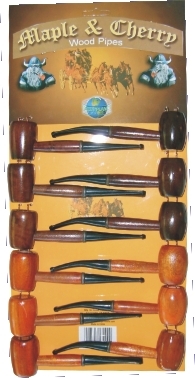 This straight wooden pipe features a classic design that is comfortable in the hand. A sturdy wood smoke path connects the dark wooden bowl to the straight plastic mouthpiece. Have the dog grab your slippers and light up this traditional Cherry Wood smoking pipe.